Sad news here about the passing of the great Jim Petrie. 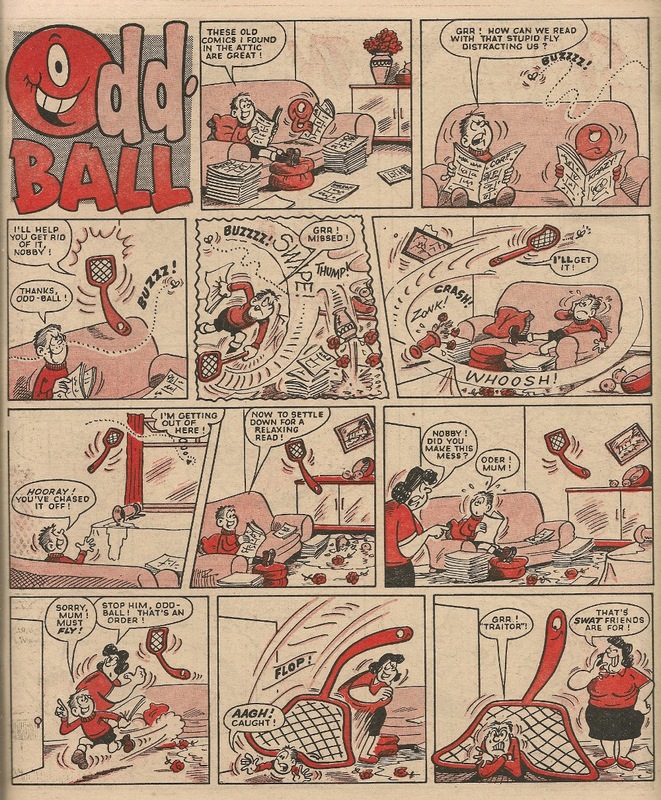 Probably best known for his marathon stint on Minnie the Minx in the Beano, Jim also did a few bits of Cheeky work, which I thought his style particularly suited. Pity he didn't do more. Thanks for all the laughs, Jim. Examining week 12 of IPC's 1979 Star Guest series means attention again turns to Whoopee! since that's where the Cheeky Weekly character visits occurred on the promotion's even-numbered weeks. Representing the toothy funster's title in Whoopee! dated 16 June 1979 was none other than our grinning pal himself, making a return after his foray into said comic's pages 2 weeks earlier. Cheeky's first Whoopee! visit introduced readers to Bump-Bump Bernie, Granny Gumdrop, Yikky-Boo and Six-Gun Sam. 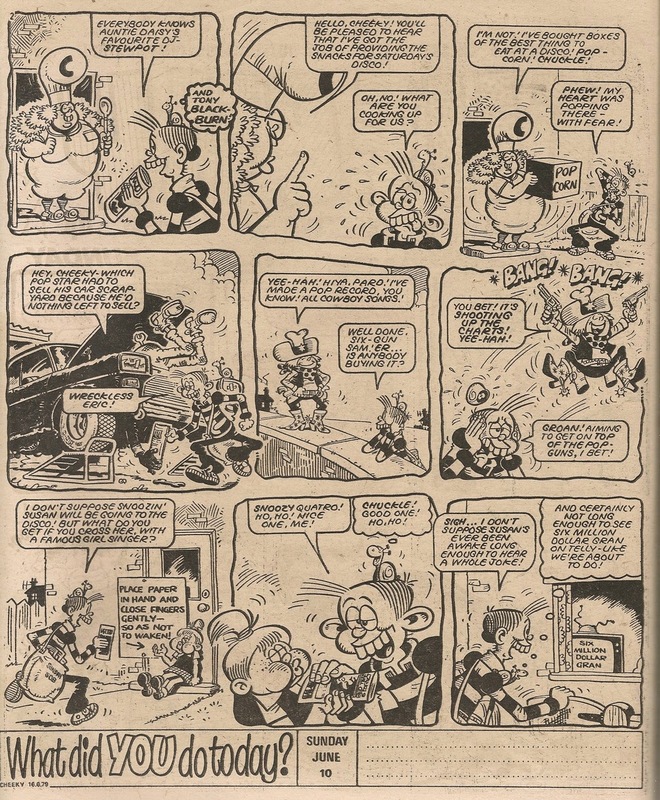 In his second promotional excursion into Whoopee!, the toothy funster met a further selection of characters from the Cheeky's Week supporting cast. Barrie Appleby did his usual excellent work on the strip, but it's a pity that Whoopee! readers weren't able to enjoy the full glory of a Frank McDiarmid Cheeky page. Presumably Frank was unavailable due to his other commitments - despite having drawn only one page in the concurrent edition of our toothy pal's comic, the mighty Mr M had no doubt been busily creating artwork for upcoming issues at the time this Star Guest was requisitioned. 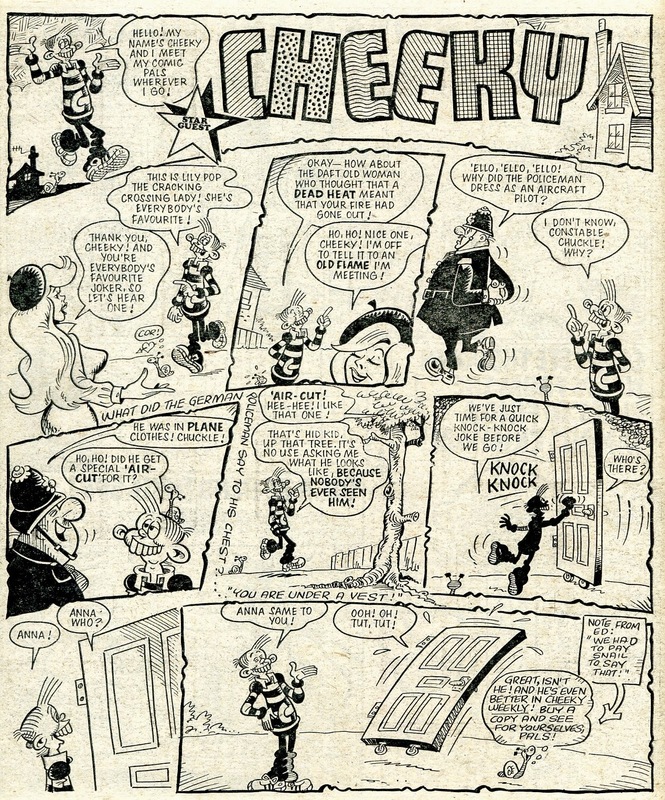 Any readers sufficiently impressed by this page of Cheeky cheeriness to set up a regular order for the toothy funster's title could have enjoyed a run of 34 issues of Cheeky Weekly before it folded and rather ironically its star sought refuge in Whoopee! It's a while since we had a special, themed Cheeky Weekly (the most recent was 31 March 1979's Jersey edition) but as promised last week, this issue is the disco special. The cover's title background is adorned with suitably festive stars and there's a star of a different kind in the cover strip as Mick Jagger drops in to enjoy a joke with Cheeky and affable agriculturalist Farmer Giles. Mick is notably silent, probably because they would have had to pay him more money had he been given dialogue. 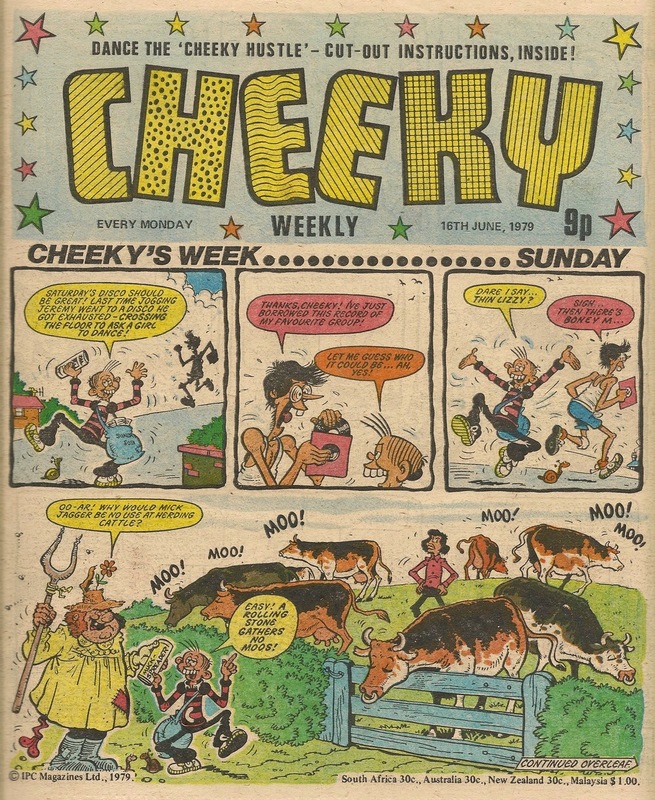 This is the final time that Mike Lacey will draw a Cheeky's Week cover strip. On page 2 it soon becomes clear that, as we go through the week in anticipation of Saturday's disco, there'll be a plethora of poptastic puns and a deal of disco drollery. Sadly, 6 MillionDollar Gran is too preoccupied with entering a cross-Channel flying race to participate in the top ten tomfoolery. What's New Kids makes a surprise return on page 8 – readers probably assumed that the advertising feature had been dropped as it last appeared in the 10 February 1979 edition. 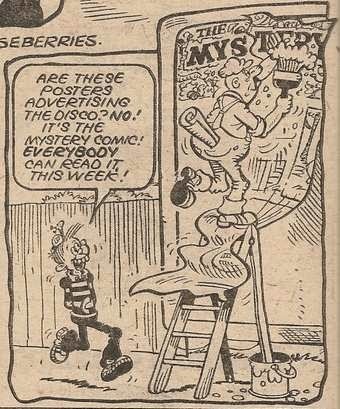 The toothy funster has no trouble tracking down a copy of the current Mystery Comic, as it seems the perplexing publication has been posted on billboards across Krazy Town this week. Elephant on the Run is reduced to a single page for the first time, but it's a typically fun episode in which our pachyderm pal employs his ventriloquial and trunk manipulation skills to evade his dogged pursuer (although it's unclear how the doll becomes larger when on the bus than it had been on stage). The latest Star Guest instalment fetches up within the Mystery Comic for the 6th (and final) time. 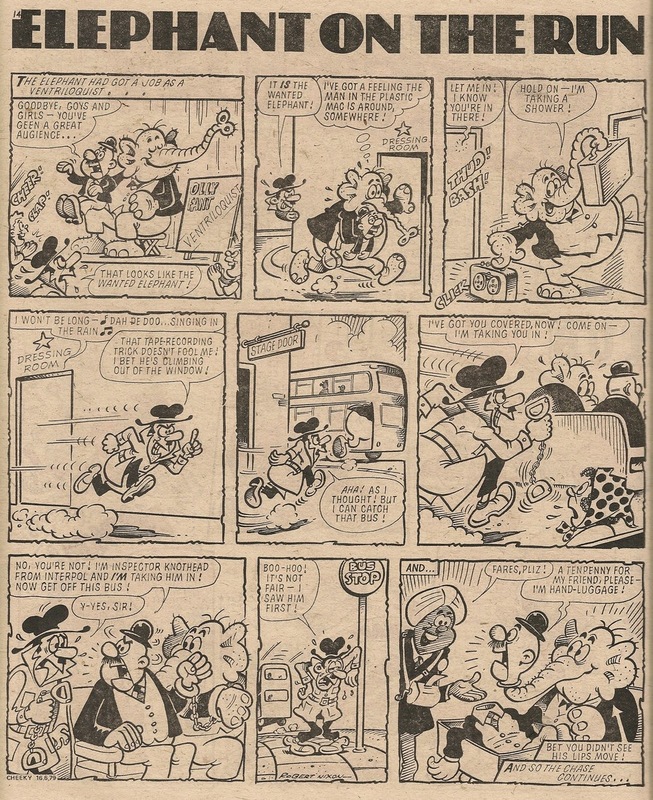 On this occasion the comic-within-a-comic is host to Whoopee's 2-Ronnies-inspired Sheerluck and Son. 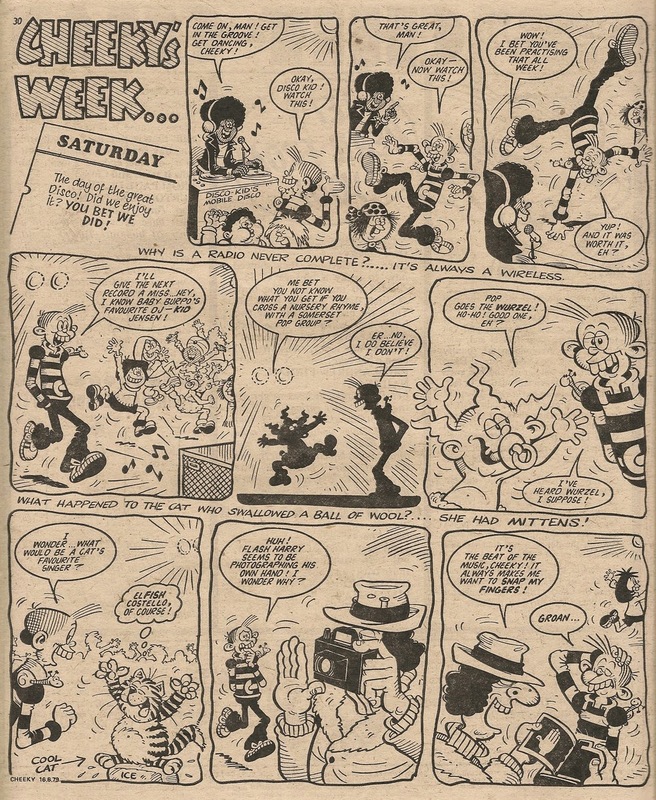 After Cheeky's dancefloor exertions there's an opportunity to relax with this week's Mystery Boy episode before the Mystery Comic concludes with Disaster Des. The presence of Star Guest and the Hustle instructions means we're deprived of Mustapha Million this week. The Cheeky Weekly section resumes with Joke-Box Jury's usual varied (and sometimes inappropriate from today's viewpoint) mix of gags, before Cheeky's Week reaches Thursday and the mounting anticipation of the forthcoming disco. Of course there are no disco-related elements in the latest instalment of Menace of the Alpha Man (partly because it's a reprint but mainly because the titular antagonist is not given to displaying his dancefloor moves), following which readers are for the first time invited to submit their guesses as to the identity of the masked menace. Although the strip hasn't yet concluded, all the necessary clues have been provided and prizes of £2 are on offer to the senders of the first 50 coupons correctly naming the hooded villain - the answers will be opened on 26 June. That leaves only the Chit-Chat page to be negotiated before we finally arrive at Saturday's disco. The toothy funster is a little premature in his assertion that 'That's all we have time for', because the comic rounds off with a Burpo Special in which the subject is Burpo himself. 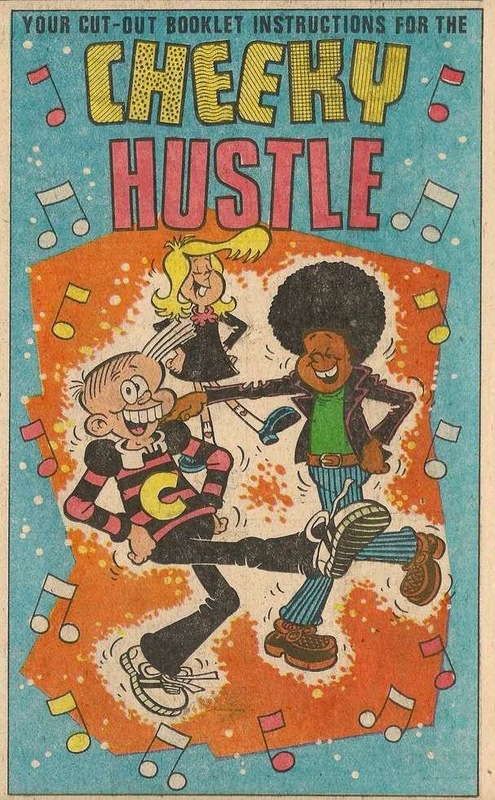 The Burpo Special is drawn by Frank McDiarmid, but all the other Cheeky's Week pages this week are by Mike Lacey, with Jimmy Hansen contributing the Cheeky Hustle booklet. 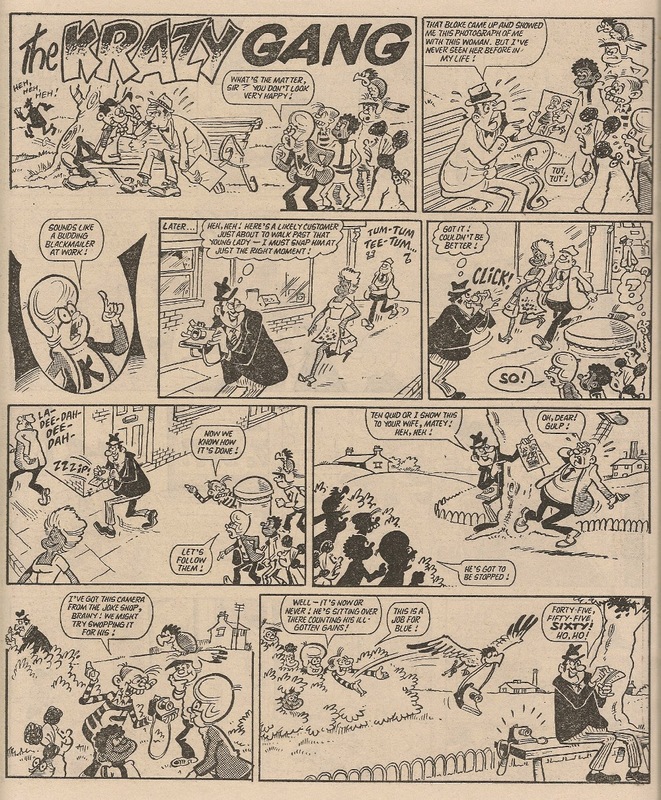 Comic publishers of the 1970s and 80s had a variety of mechanisms for publicising their titles. TV advertising was very expensive so was reserved for comic launches only. 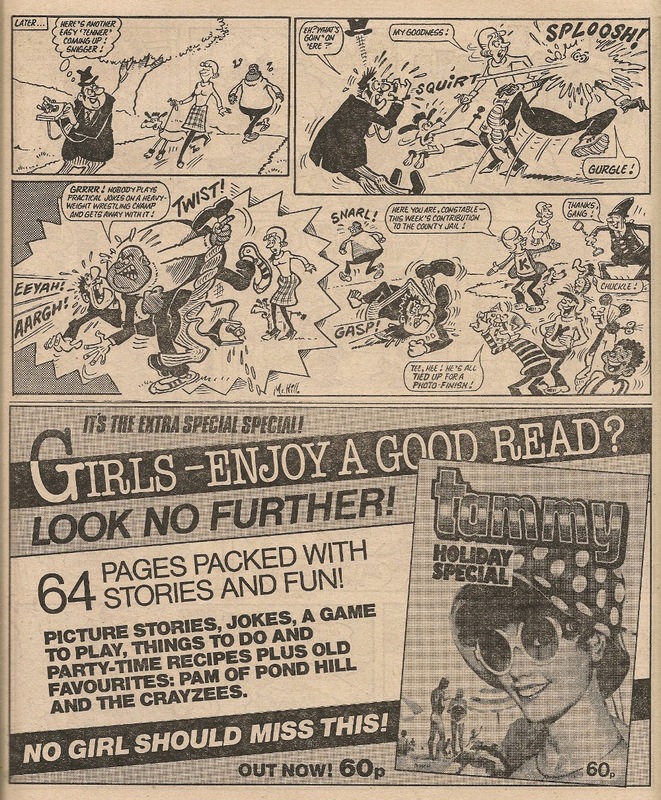 Having ensnared kids into regularly purchasing a comic, the publishers would include advertisements for other comics from their line in the hope of inculcating a weekly multi-comic habit. Cross-title promotions such as Mini-Comics or Star Guest were also employed. However, there was another oft-used device whereby the comic strips themselves featured characters reading companion comics. It wasn't uncommon for a Buster character to be depicted enjoying a copy of Whoopee! or Whizzer and Chips and so forth. This example is a little different. Rather than showing Odd-Ball and Nobby perusing copies of contemporary titles, Terry Bave chooses to show his protagonists delving into a pile of 'old comics'. The titles that our heroes select from among the yellowing piles of funny papers are Cor!! (which had ceased weekly publication in June 1974) and Krazy (the weekly expired in April 1978). Most readers of this 02 November 1985 issue of Whizzer and Chips wouldn't remember the weeklies, but some may have been aware of the titles from the annual versions which continued being published into the mid-1980s. Nice that Terry gave a nod to comics history, though. Thanks for bearing with me as I went slightly off-topic. Will be firmly back on-topic with the next post.